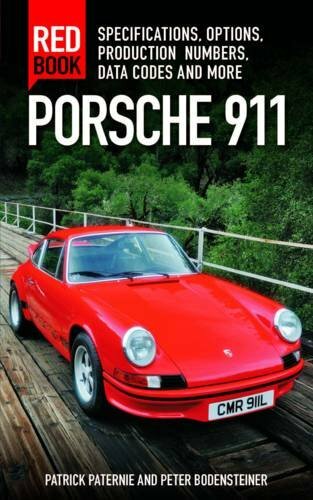 Updated November 2013: This has apparently been sold to a long-time Porsche enthusiast. 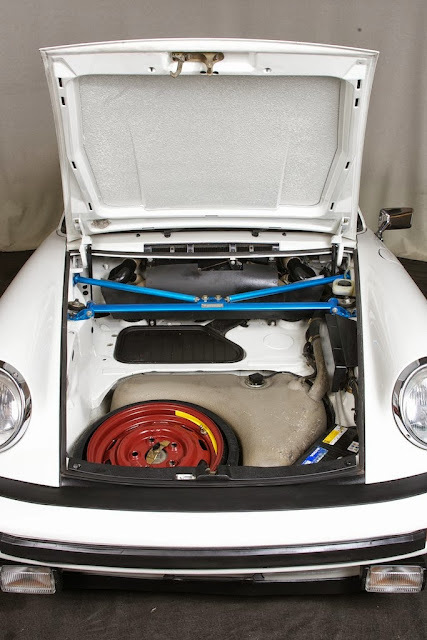 Posted 9/29/13: One last Carrera is available on "Grand-Prix White Weekend". This time a '75 Carrera 2.7 MFI painted Grand-Prix White (originally yellow) with blue Carrera script and 15 x 7J and 8J Fuchs wheels. 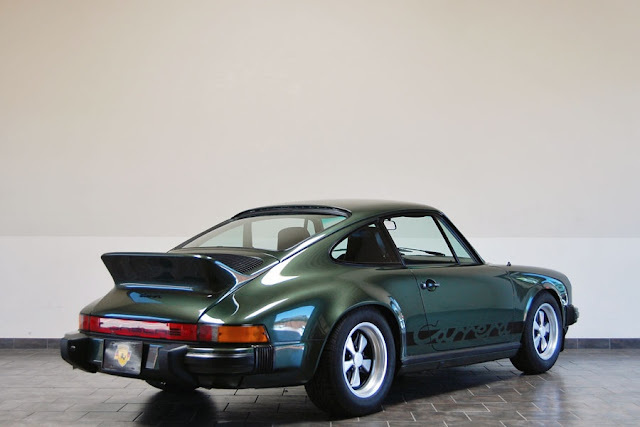 With 121,704 km on the odometer and first registered May 1975 this was one of the last '75 Carrera to be built. 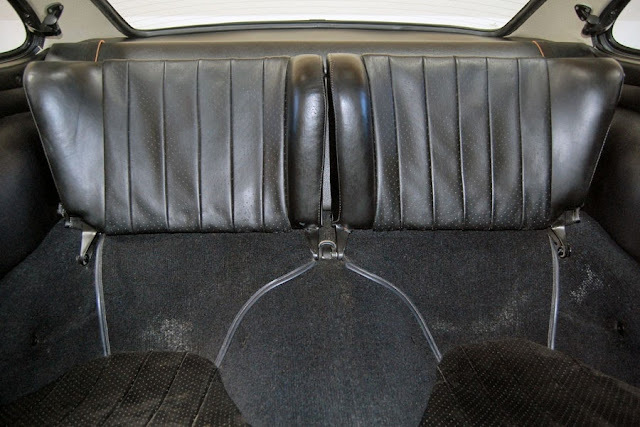 Original equipment is unknown but currently fitted with Sport seats, correct '75 version of the whaletail, replacement radio, mostly original interior. Later style front orange side markers from the 1980s added. 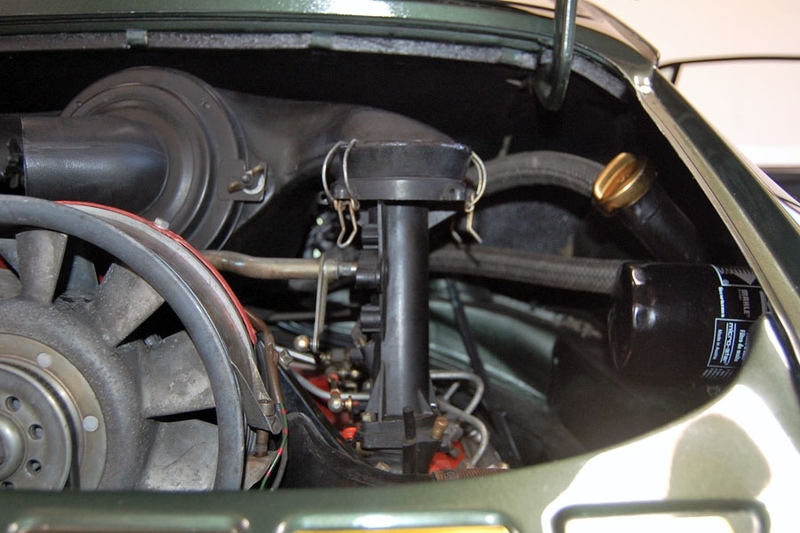 Engine is complete with the snorkel, replacement coil, and missing a decal or two but otherwise appears to be correct. 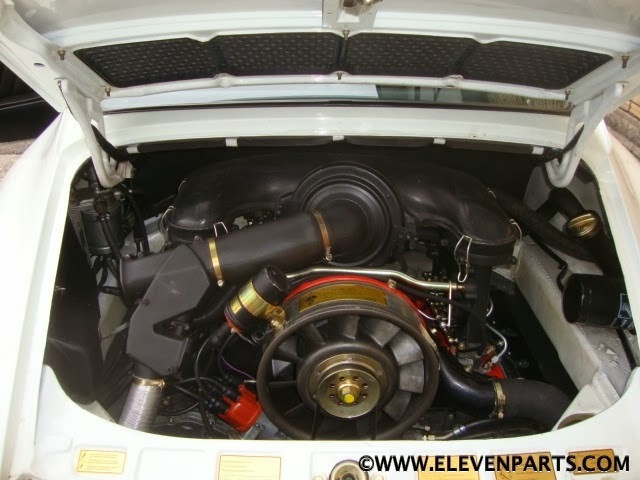 No mention if this is the original engine or whether it is a correct type 911/83. Offered for €89,250 (approx. $121k USD). 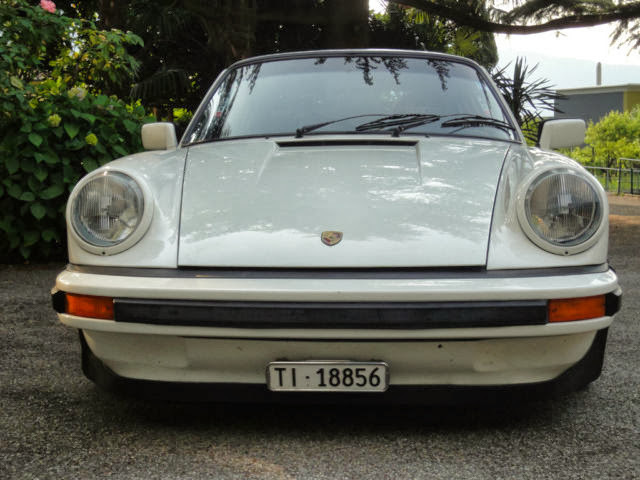 Another Grand-Prix White Carrera is available, this time one of the rare 1976 Carrera 2.7 MFI Sondermodells, chassis #911 660 9084. 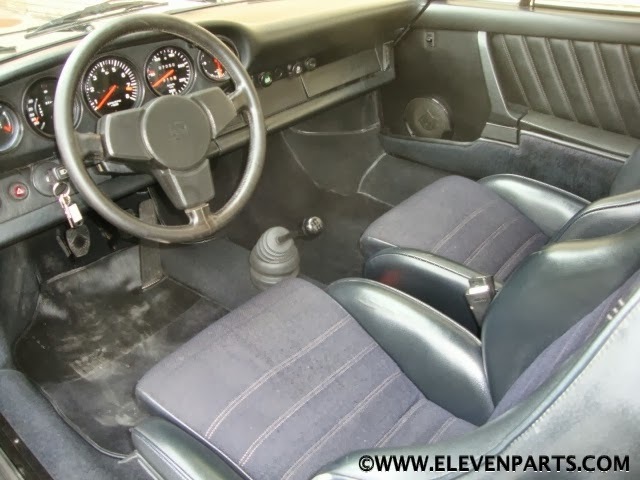 Door panels and floor mats were replaced at some point, otherwise interior looks pretty original. 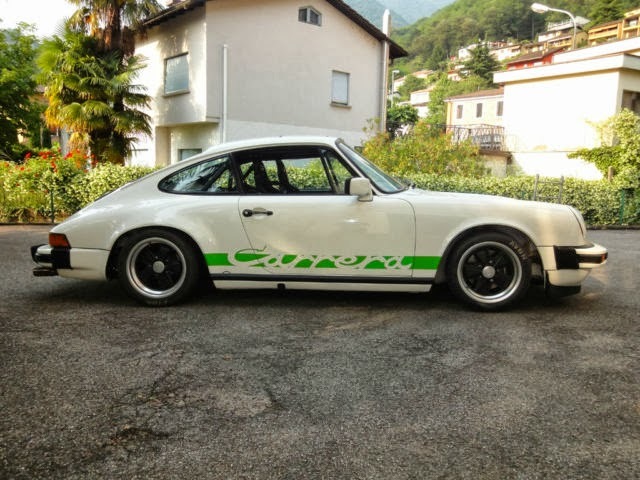 This Carrera has had a complete repaint in white. 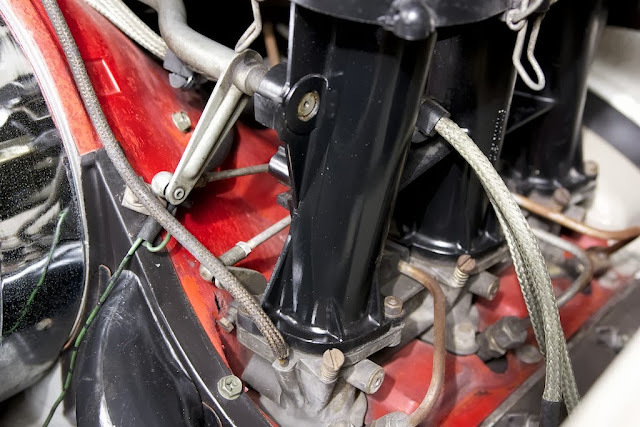 Matching engine. 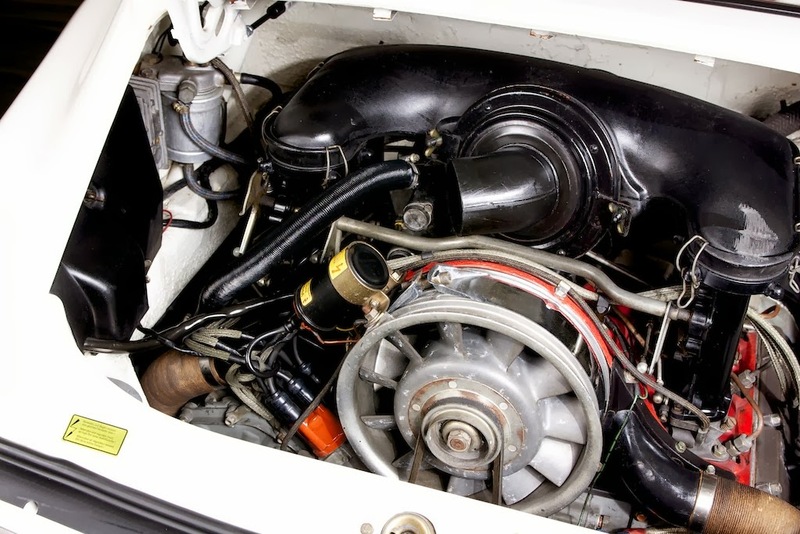 1976 was the very last year that only 113 cars received the well known 2.7RS engine 911/83. In conjunction with the new zinc coated chassis it makes this 911 model highly desirable. 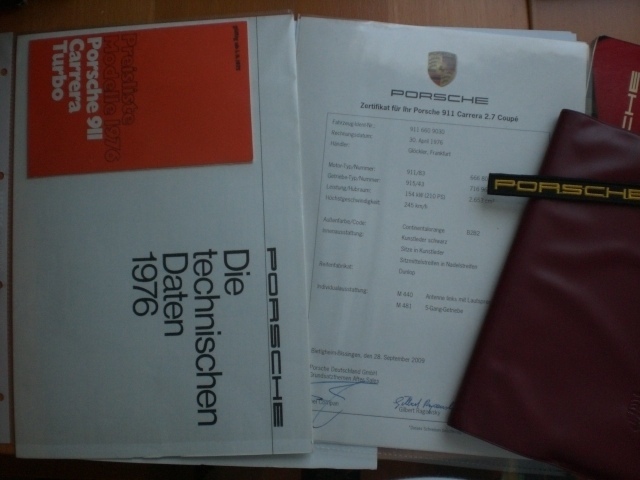 The car was delivered new in Germany, It has the old German title (5 owners) and a new Swiss title with the current owner. The car has been fully rebuilt in every aspect. 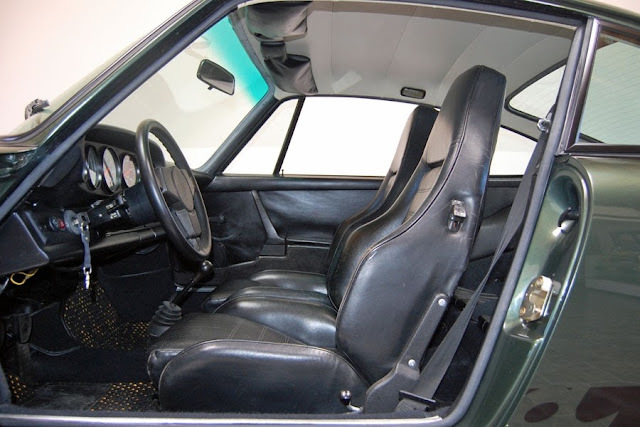 Most of the interior seems original with the rare blue/black Shetland cloth seat inserts. It runs and drive simply excellent, a joy to drive and ideal for long trips. 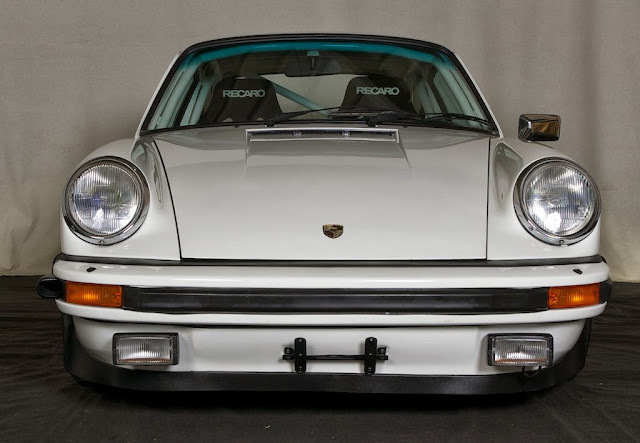 But it still has the bite of the true 2.7RS ! Offered for €150,000 (approx. 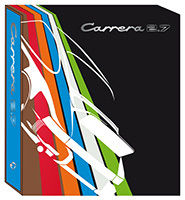 $203k). 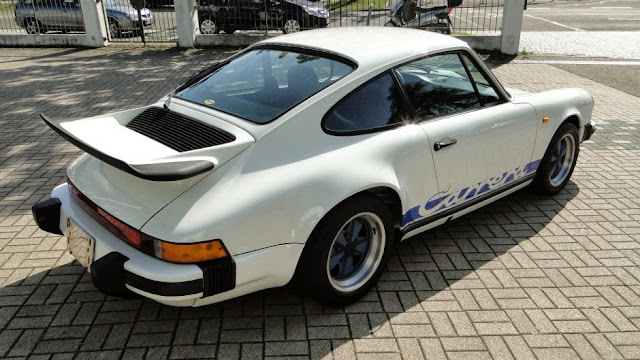 Another '75 Carrera repainted in Grand-Prix White (from original yellow) and equipped with a roll cage and racing seats is available in Germany. Original mirror replaced with later electric flag style. Green Carrera script added. 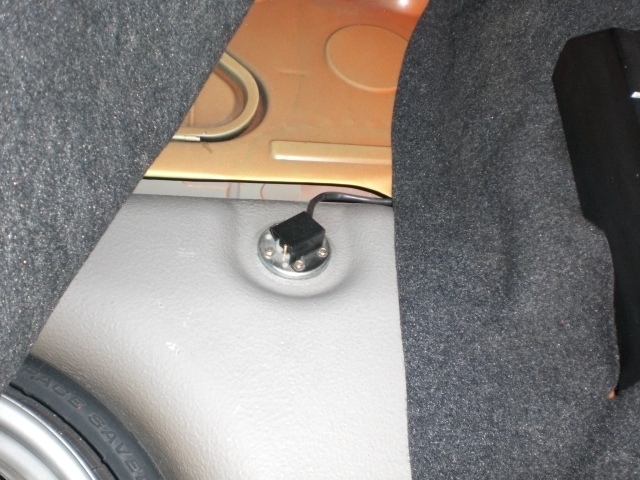 Missing original MFI airbox in photos, though this may be available from seller. 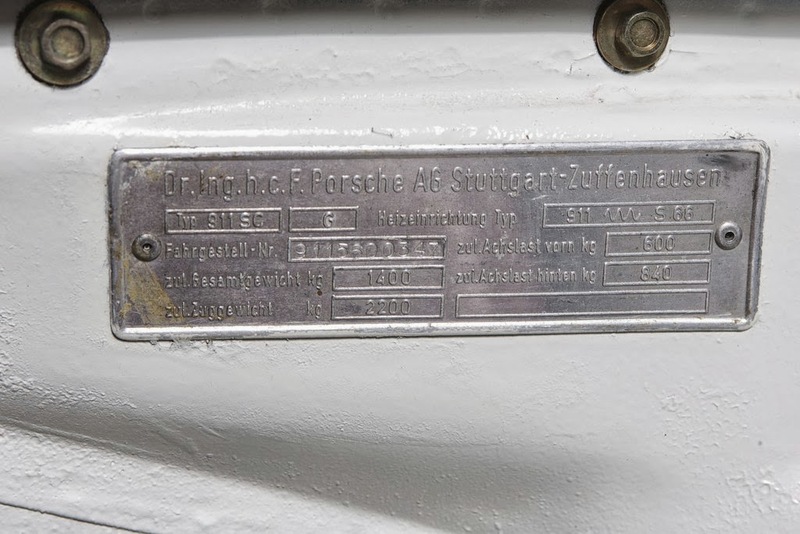 In 1975 the 7J and 8J Fuchs should have black center caps when black center Fuchs are fitted. 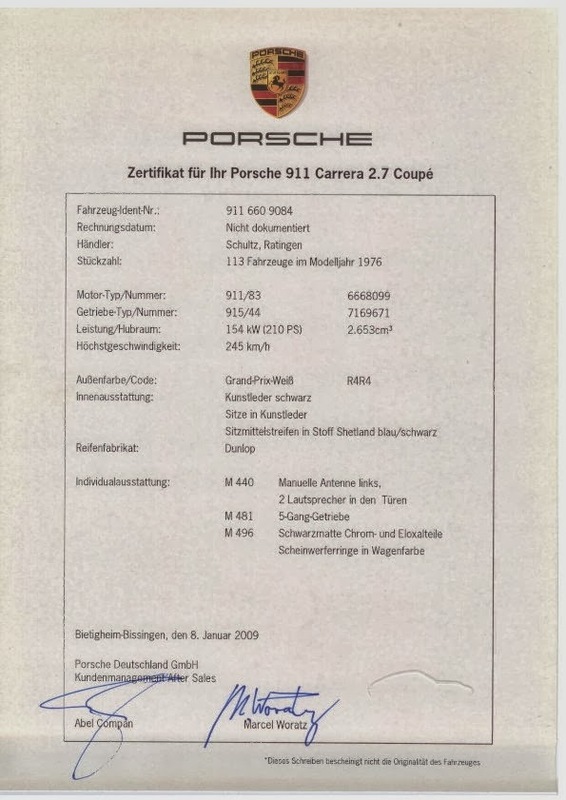 Carrera 2.7, Fahrgestellnummer 911 5600 482 Motor und Getriebe neu überholt, Motor leistungsgesteigert durch Firma Manfred Niederhof, Tutzing, Leistung ca. 282 PS, Hubraum 2900 ccm, km Leistung total ca. 185'000. Fahrzeug ist unfall- und rostfrei. Die Lackierung ist etwa 10 jährig und in gutem Zustand, das Fahrzeug war jedoch ab Werk in hellgelb lackiert. 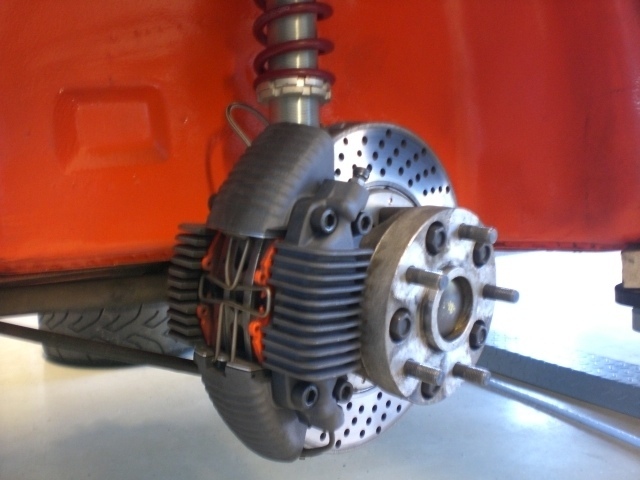 Die Carosserie ist im Originalzustand, Fuchsfelgen 7 + 8 x 15. Carrera 2.7, chassis number 911 560 0482 has a newly overhauled engine and transmission by Manfred Niederhof. Engine power increased to about 282 hp with a 2.9-liter. Approx 185,000 km. Vehicle is accident and rust free. 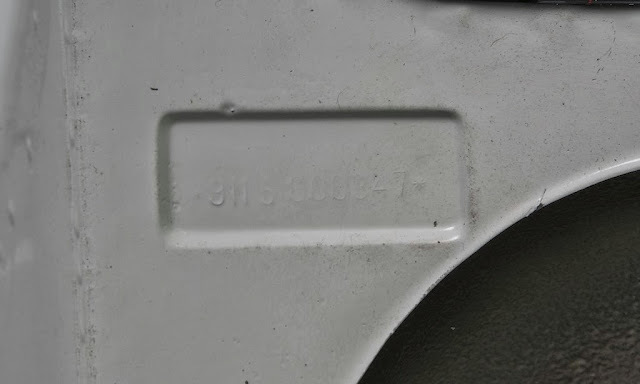 The paint is about 10 years old and in good condition, but the vehicle was painted at the factory in bright yellow. The body is in original condition, 7 + 8 x 15 Fuchs. Offered by private seller for €66,000 (approx. $89k USD). Update 10/25/2013: What a different a month makes. 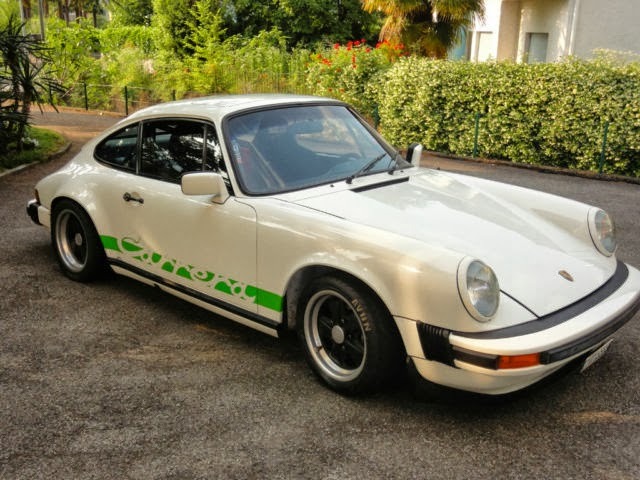 This '75 Carrera is now on offer for €104,000 EUR (approx. 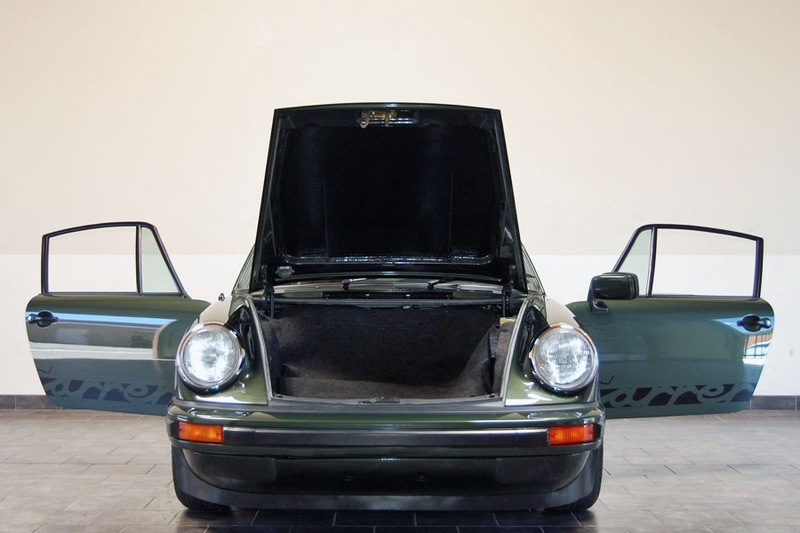 $144k USD) by a French dealer. Posted 9/27/2013: This Grand-Prix White 1975 Carrera was just recently imported into the US from Japan where it spent the majority of its life. 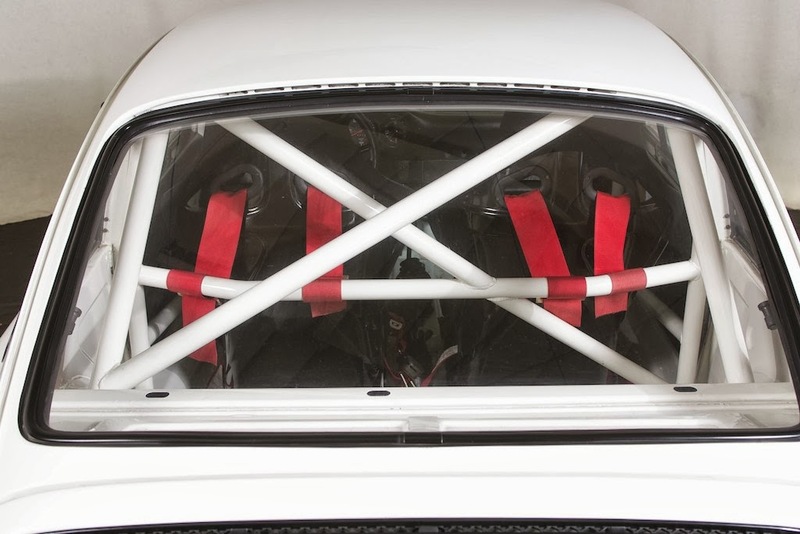 It has been heavily modified for track use including roll cage, strut tower supports, RS door panels, reproduction ducktail, 73 RS style red decals and wheel finish, etc. Entire chassis was repainted at least once. 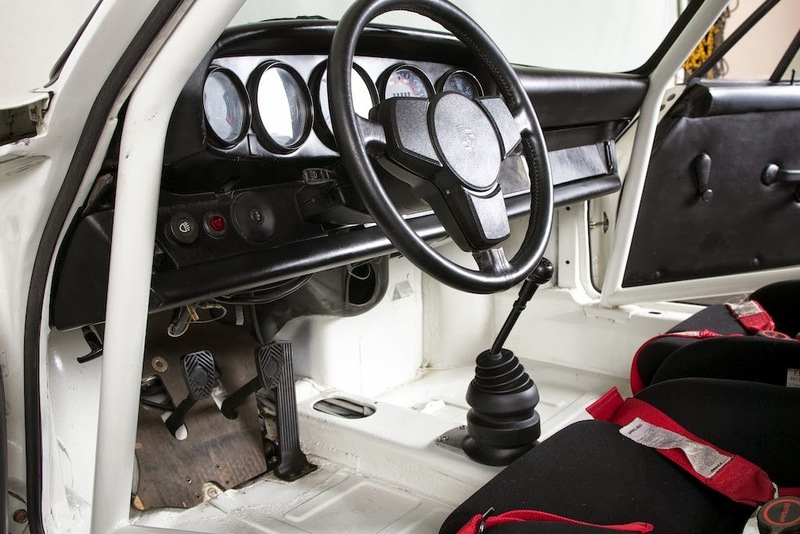 Certainly not for the purist as even converting back will require significant investment to remove cage, source interior including recovering dash, tires and Fuchs, glass, and correcting details will take considerable funds even if just left in current Grand-Prix White color. 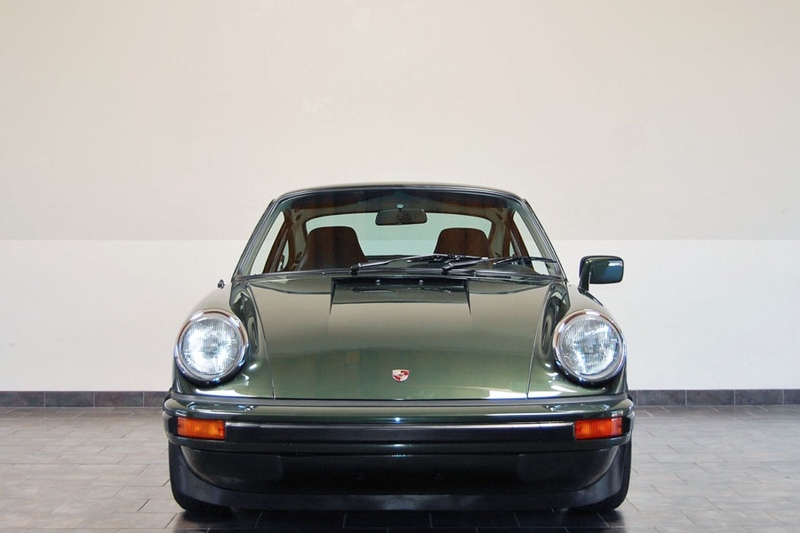 However, this is quite fairly priced for someone who wants to just enjoy and use a 911 that originally came with a legendary RS-spec 911/83 MFI engine, supposedly numbers matching and original, might take a peek. 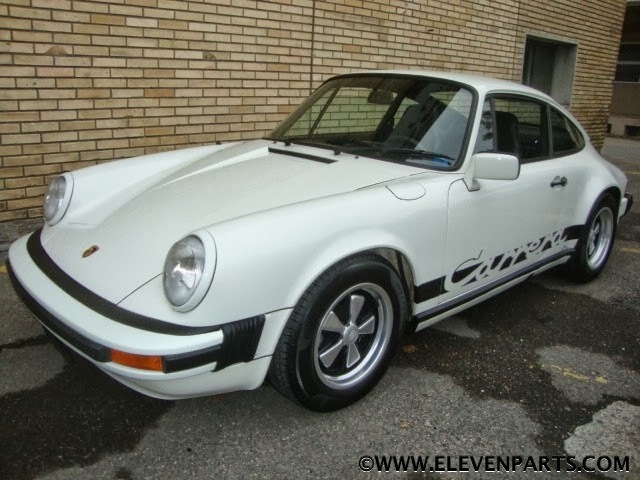 This 1975 Porsche 911 Carrera 2.7 MFI is in Grand Prix White with Black. 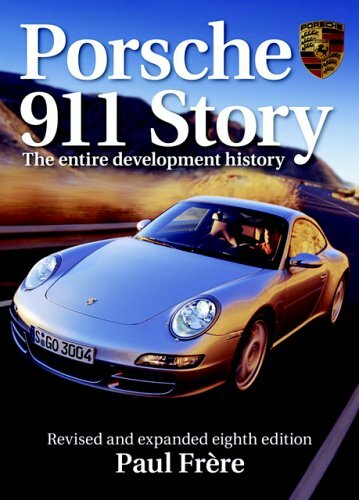 Porsche's model Nine-Eleven needs no lengthy introduction: blessed with a timeless design, it's easily the most recognized sports car on the planet. 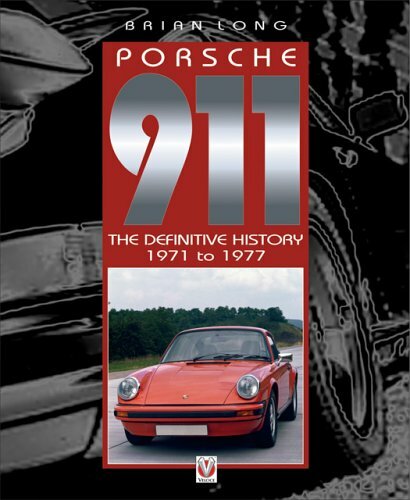 Among all the 911s, a few models have achieved elevated status and desirability. 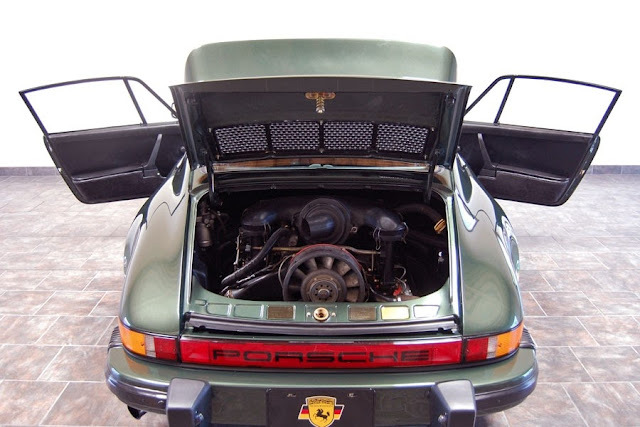 One of them is the early 2.7-liter Carrera, named after the famous Carrera Panamericana road race in Mexico. 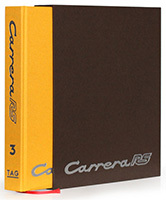 This is car #347 of the 518 Rest of World (ROW) Carrera's produced for 1975. Less than 52 km's (31k miles) showing on it's correct 300KM speedometer. A matching numbers car - engine and transaxle. 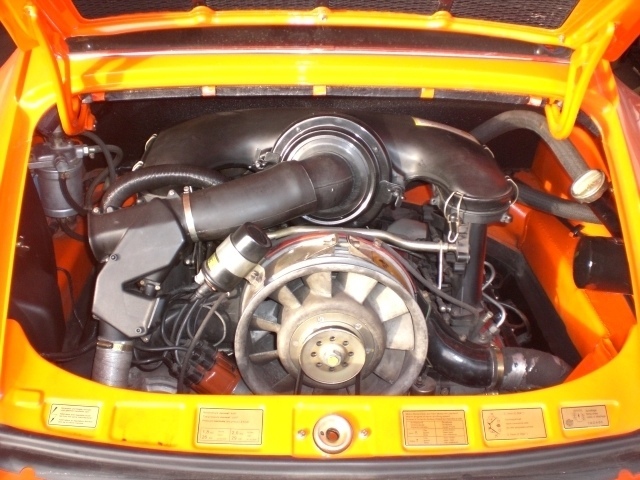 The original 2.7 ltr 210 bhp RS motor. Originally sold to Europe. Imported into Japan in 1978. Imported to California in 2013. Currenlty on Japanese title / Importation documents. 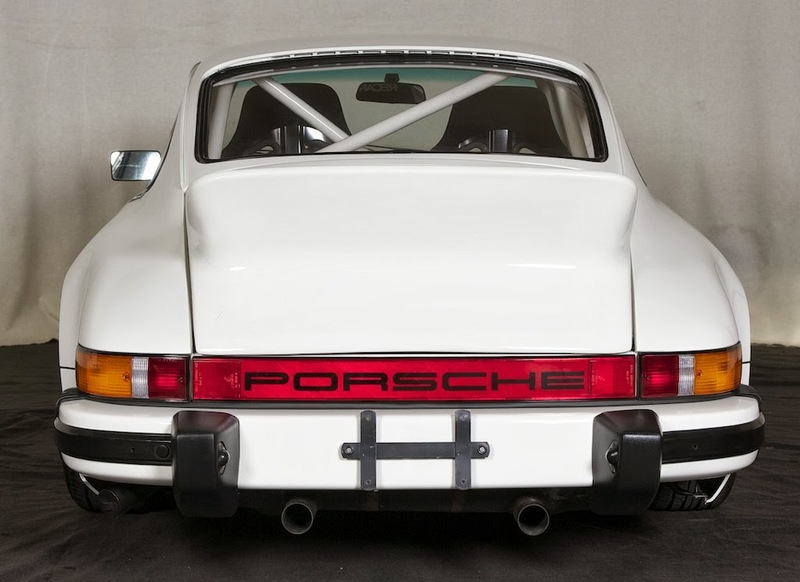 This 1975 Porsche 911 Carrera 2.7 has been painted Grand Prix White with Red graphics. The oiginal color is Silver Metallic. This Zuffenhausen-built supercar starts easily, idles smoothly, and sounds ferocious with it's sport exhaust. 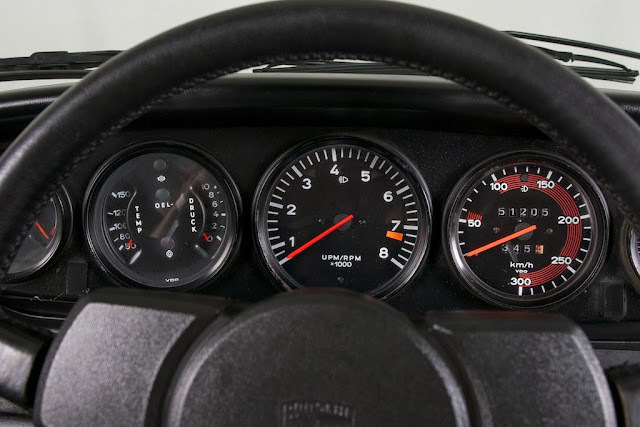 Equipped with Porsche's Type 915 five-speed manual transmission, the Carrera shifts with confidence and accelerates effortlessly through all gears. Good syncro's in all gears and a sound clutch. Recently replaced Turbo tie rod ends and alignment done. 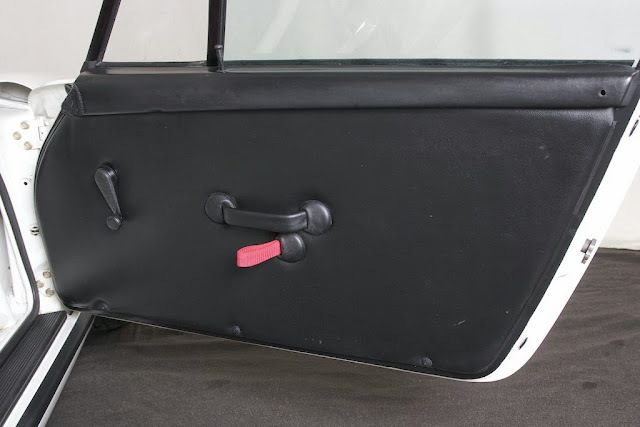 Original fenders on all four corners. Excellent panel fit. Both doors shut with the correct "ping" sound. 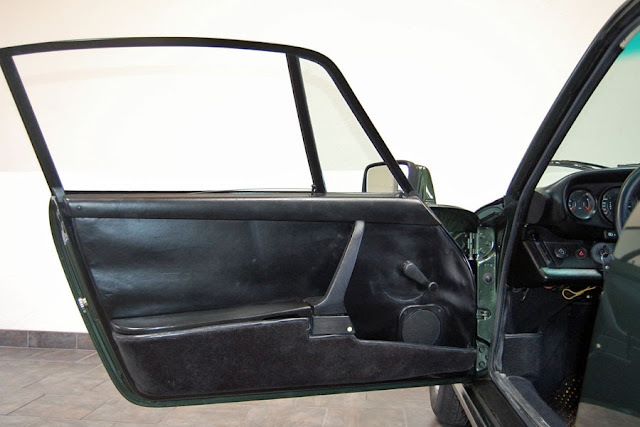 Fiberglass ductail installed. A high quality repaint. Very consistant over the entire car. Excellent condition. Little to no evidence of road use on the usual areas: front valence, lower portion of the hood and in front of the rear wheels. Interior has been removed. A roll cage has been installed. 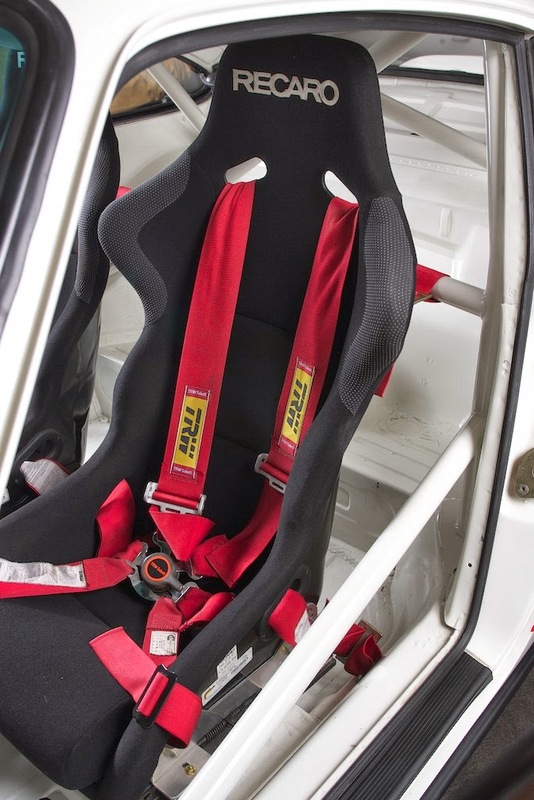 Recaro sport seats, and plexi glass installed in the rear 3/4 window and rear window. 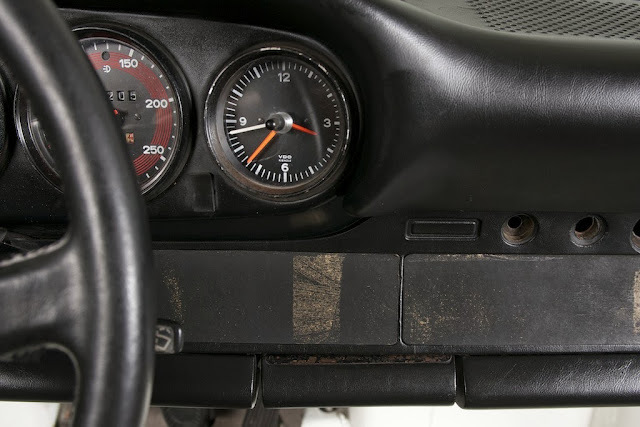 Original dash, gauges, steering wheel and shifter. 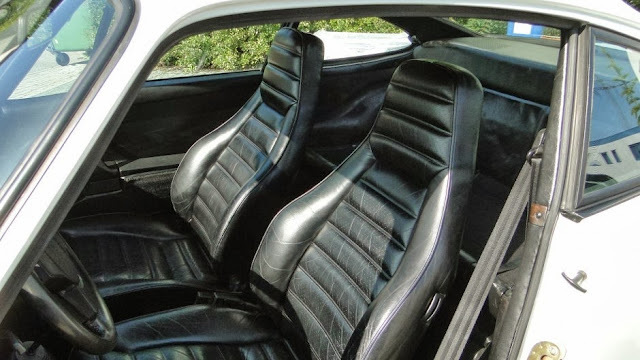 Original interior items for the car available.This includes but not limited to: headliner, door panels, carpet, seats, door handles and glass. Matching Yokohama tires on Factory 7" and 8" Fuch wheels. Tires are quite old showing dry cracking yet look hardly used which also is an indication to the little amount of use the car has seen. A rare opportunity to acquire one of the few real Carrera 2.7s currently in the country. 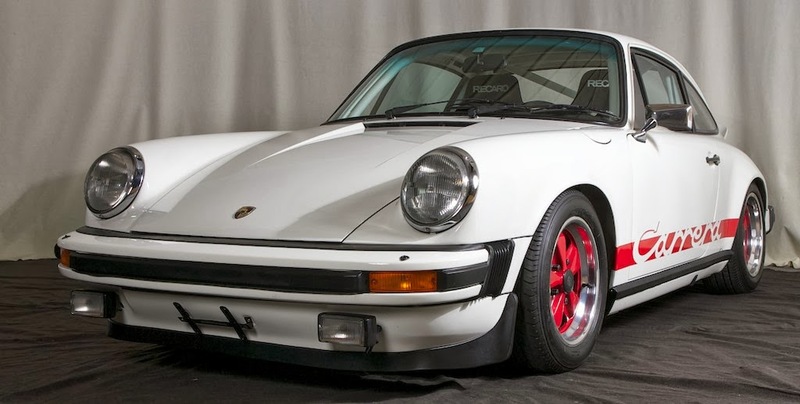 This particular model is a well kept secret, even among Porsche aficionados. 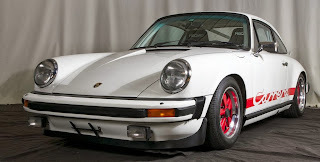 Offered for $137,500 USD by dealer. Updated 9/19/2013: Price reduced to a more realistic €184,000 (approx. 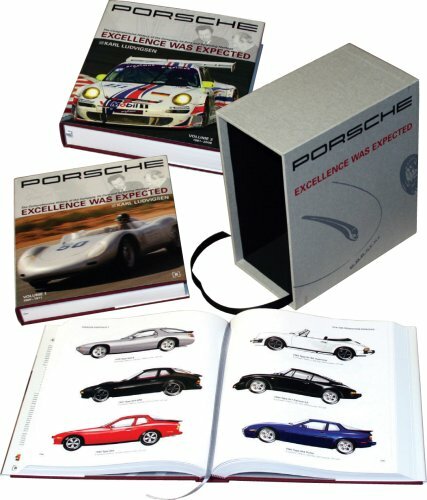 $249k USD). 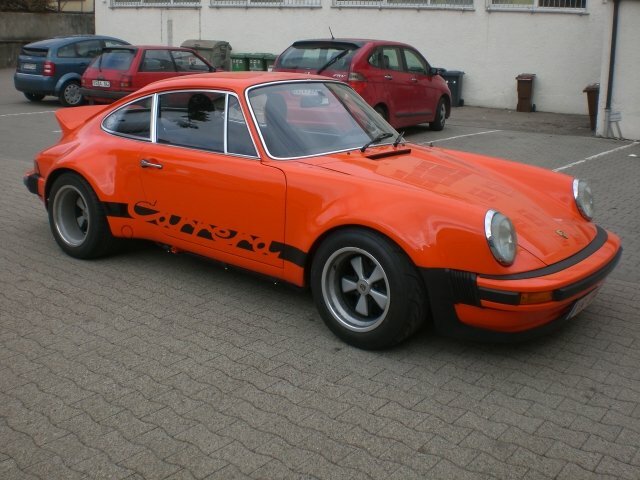 Posted 9/13/2013: 1976 Carrera 2.7 MFI #9030 is being offered for sale by a private party in Germany. 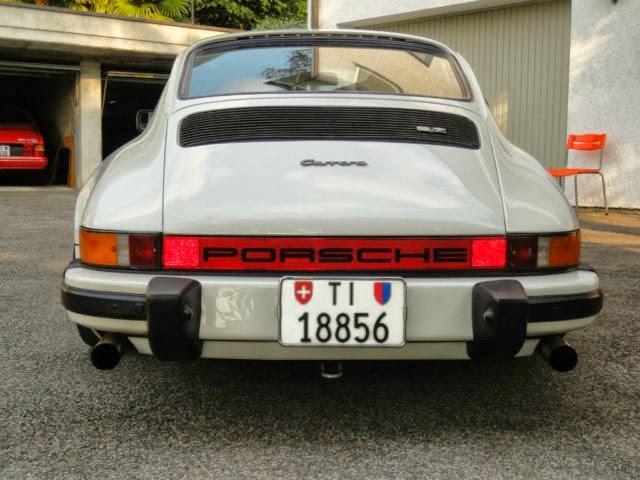 First registered August 1976 this Carrera was distributed via Glöckler in Frankfurt, Germany as a special order model (aka "sondermodell"). Painted in its original Continental Orange color, which looks good with chrome trim, however likely converted to RSR front and rear flares at some point in its life. Paint in the front boot looks original but has had at least one exterior repaint. Includes books, pouch, and some documentation. 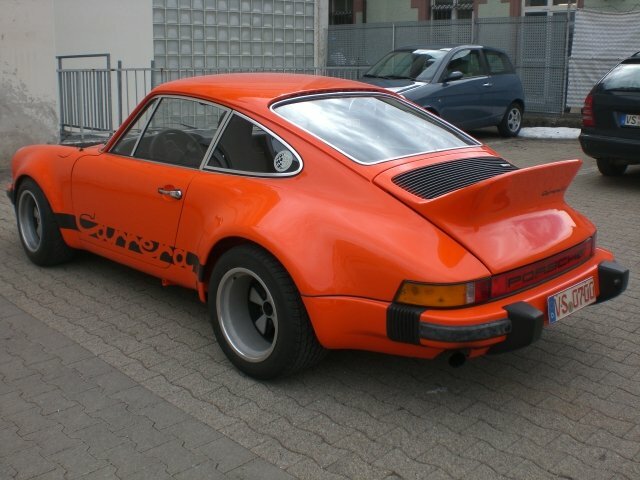 Dieses Porsche 911 Carrera 2,7 RS befindet sich in einem einmaligen Sammlerzustand MATCHING NUMBERS!! Es verließ Zuffenhausen als eine Sonderserie mit dem 2,7 Carrera RS Motor und befindet sich heute noch in seinem einmaligen Neuwagenzustand dazu absolut unfallfrei, H-Zulassung alle Dokumente Historie sind vorhanden, ZF 40% Sperrdifferenzial, Continentalorange, RSR Bremsen M491…. 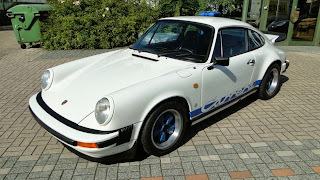 Das dürfte der beste dieser seltensten Sonderserie 2,7 Carrera RS weltweit sein!!!! Racing seats have replaced the original black leatherette with tweed inlays. Only official options were manual antenna & speakers (M440) and 5-speed (M481). 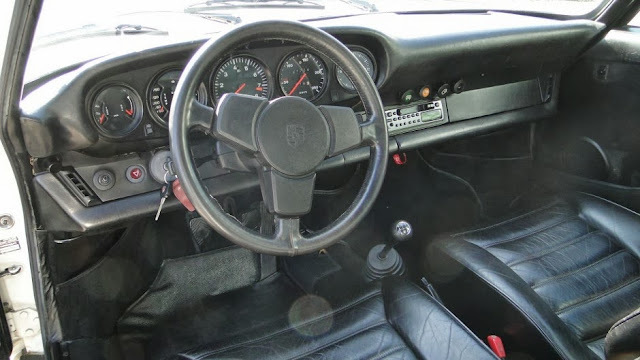 However, the '76 Carrera 2.7 MFI sondermodell came standard with a number of sporty options including the 210hp 911/83 RS-spec engine, Bilstein shock absorbers, limited slip diff, among other options. Ducktail fitted instead of plain decklid or whaletail, though tail options never appear on the '76 Carrera 2.7 MFI sondermodell options list even if delivered new from the factory. 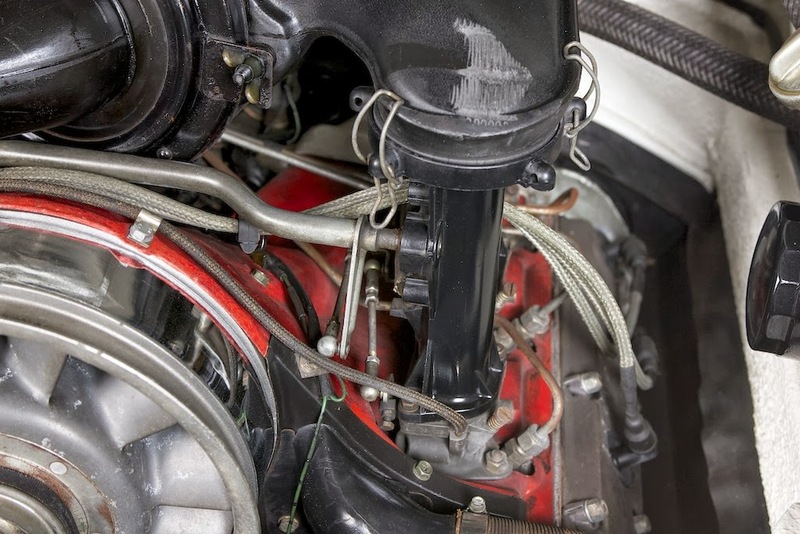 Engine appears to be very original with all the right details. RSR style wheels not original. 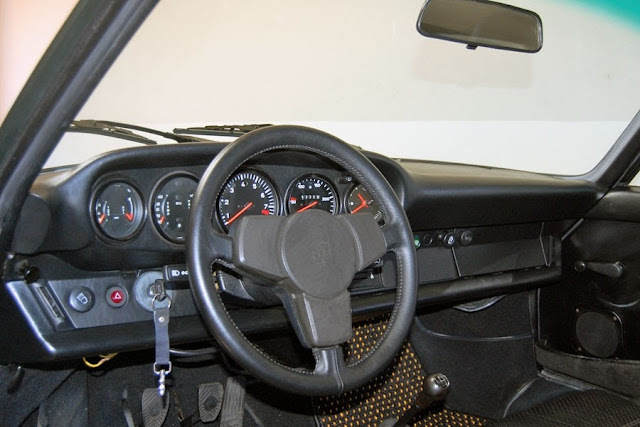 Missing driver side flag mirror but this would be easy to add. Price seems optimistic. 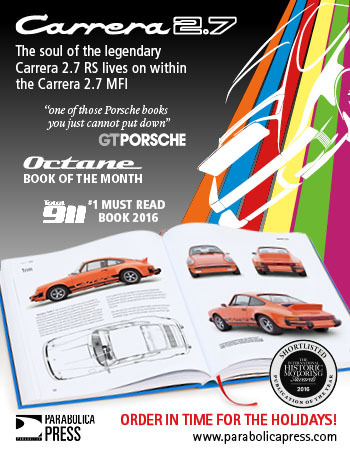 Featured in 911 Carrera 2.7: Im Toten Winkel article from unknown German magazine. Appeared without ducktail, dual driver and passenger mirrors, RSR look, and Porsche side script. Offered for €254,000 (approx. $337k USD). 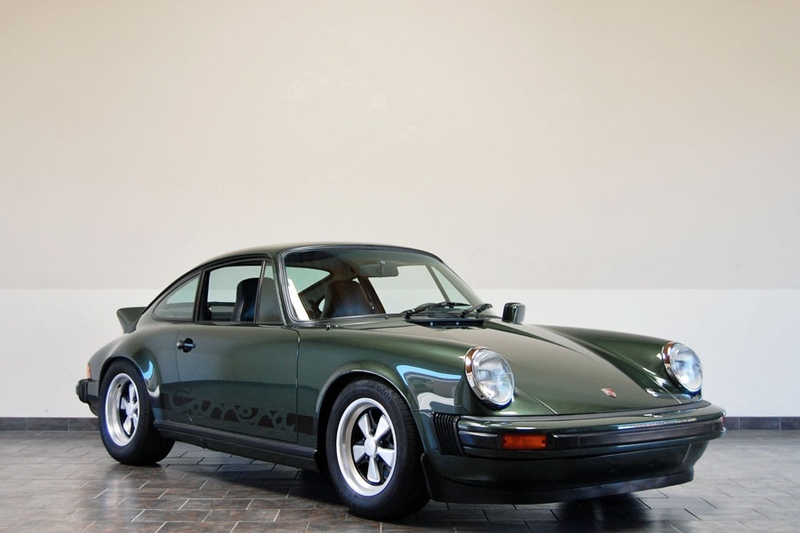 This Oak Green '76 Carrera #911 660 9076 is one of the exceptionally rare -- only 113 built -- mechanically fuel injected Carrera 2.7 special models produced for 1976. 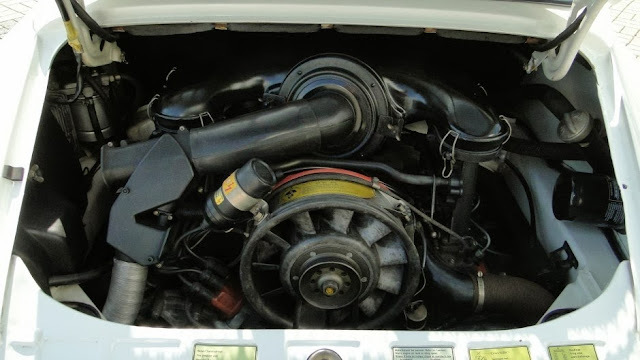 These were non-production Carrera that were ordered from the factory as a "sondermodell" which included as standard LSD, Bilstein shocks, Sport steering wheel, flares, and the all important 911/83 210hp RS-spec engine. Oak Green is a rare color for mid-1970s 911s with only six '76 Carrera MFI 2.7 originally painted this color. According to COA data #9076 came with a driver side manual antenna when new, but now appears with an automatic antenna without a radio. 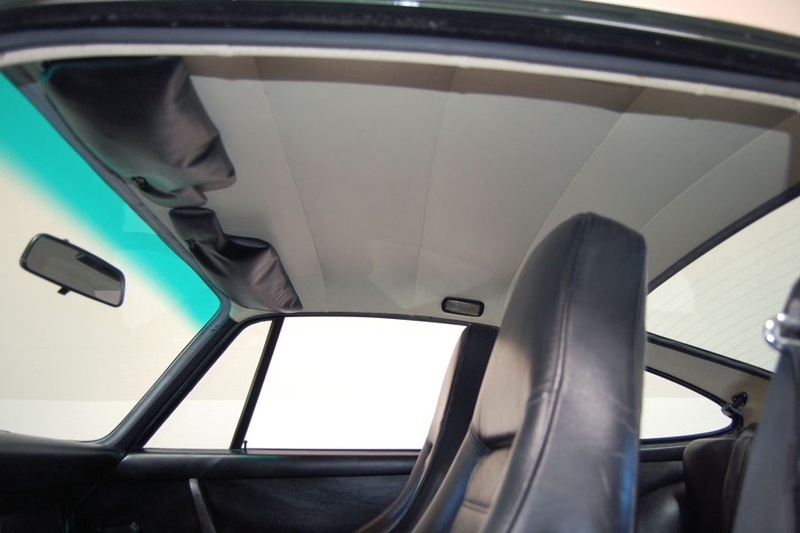 Also originally equipped with black headliner (replaced with white at some point) and tinted glass from the factory (windshield replaced). Adding to the value of this Carrera is the original owner's manual with service stampings and supposedly has full service documentation. Buyers should note that the engine was rebuilt by Andial to a 2.9-liter twin plug engine. Additionally some flourishes were added by later owners which weren't originally delivered from the factory including ducktail, Carrera side script, Sport seats, coco mats, later style replacement tinted windshield, earlier '74-'75 and thick grip Sport steering wheel. Interior was redone at some point, though still looking pretty rough, since door pockets are carpeted ('76 Carrera MFI sondermodell didn't have carpeted pockets), incorrect leatherette material was used for seat inlays front and rear (likely swapped from another 911), Sport seats swapped in, headliner is now white, and speaker grill appears to be a later replacement cover. 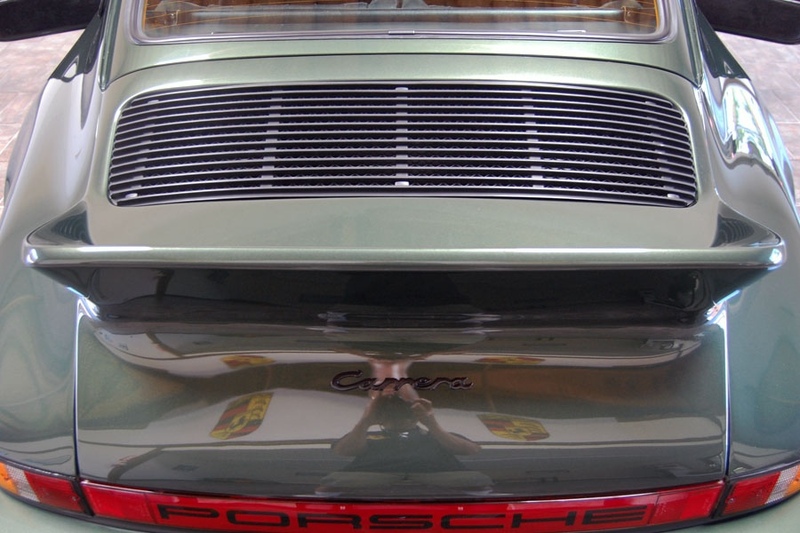 As this Carrera came with the black trim from the factory this is missing the painted headlight trim rings. The rare original midnight blue extra rough and lightweight carpet remains as well as the original orange tags on the seat belts. Offered for $185,000 by dealer.